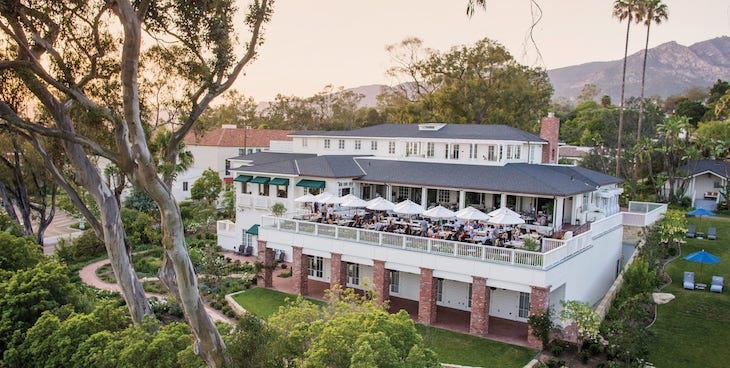 Global French luxury brand LVMH is purchasing the upscale Belmond hotel company which includes the El Encanto on Santa Barbara's Riviera. LVMH, who also owns the Louis Vuitton, Moët, and Hennessy brands, will pay $2.6 billion for the Belmond company which owns 46 luxury hotel, restaurant, train, and river cruise properties. In the twelve months ended September 30, 2018, Belmond recorded total revenues of $572 million. The transaction is expected to complete in the first half of 2019 subject to the approval of Belmond’s shareholders and clearance by the relevant competition authorities, according to a joint press release. Belmond, formerly known as Orient Express, announced in August it was putting itself up for sale. They previously took seven years to renovate and reconstruct the El Encanto property and reopened it in 2013. With a deep history in Santa Barbara, the property was established in the early 1900s with an official opening on February 2, 1918. El Encanto Hotel and Garden Villas quickly became popular with Hollywood's elite and politicians. President Franklin D. Roosevelt enjoyed a stay as did Clark Gable, Carole Lombard, and John Kennedy, Jr.
LVMH previously stated it was looking to expand into luxury experiences as a way to introduce younger consumers to its established goods brands. The company also owns Bulgari hotels and the Cheval Blanc luxury resort properties. Beautiful place to show off the quiet side of Santa Barbara. Treat yourself to lunch on the deck when it is a perfect day. Can the resentment and just enjoy how lucky you are to be here. You can afford it. We had an anniversary dinner there. We were the only ones in the restaurant - weird. When we returned to our car we tipped the valet. The valet had turned the radio station to Christian radio and cranked up the heat. I spoke to the hotel manager about the maturity of their valets. Real Orient Express service. Anyone familiar with the "club" environment in Scottsdale, AZ? I was just there, stayed in Scottsdale, and was driven cray-cray by the base banging away until 2a.m. EVERY night. Focus on young people..."expand into luxury experiences as a way to introduce younger consumers". Get ready for loud (base) music, neighbors. LOTS of drinking and loud bands, like a wedding every night. Parking everywhere and anywhere. For once, I'm glad not to live on the Rivieria. But, best of luck to all involved. Sounds like an upscale company. I suppose I'll have to buy a new Bentley to make a Grand Entrance at El Encanto, as my old 2015 model is now considered shabby chic. Or maybe I'll keep the old one for slumming at the Biltmore. Oh bummer. This will certainly ruin my weekend plans.